Setup was fast and easy. The Orbi brought a page up in my web browser and ran me through the setup. I was given the option to download NETGEAR Genie as part of the router setup. It even brought me to a page where it scanned for updates and allowed me to click “update all” for the firmware updates. I was completely finished in approximately 45 minutes. This included plugging in and setting up the router in my home office, placing and connecting the satellite in a second floor bedroom, downloading NETGEAR Genie on 2 separate devices (my desktop PC running Windows 10 and my mobile phone running Android 6.0.1), setting up an account with OpenDNS to set up parental controls, and adding the network to the immediately available devices (3 mobile phones, 2 laptops, and 1 desktop PC). It was not clear if I was setting it up in Router mode or Access Point mode, but I did find that information later while playing with the settings. All testing was completed with the Orbi in router mode and placed up against my Xfinity modem/router (both devices broadcasting their own networks in an effort to test for interference from either device). Despite the construction of my house and the Orbi Router’s placement, I had no problems accessing the network and getting amazing speeds on my Samsung Galaxy S7 Edge. Through the original network on my Xfinity provided router, I was receiving download speeds between 25Mbps-57Mbps. Through the Orbi, I was receiving download speeds of approximately 125Mbps. Upload speeds were consistently around 25Mbps from each router. It did not seem to matter whether I was on the first floor with the router or on the second floor with the satellite, the speeds were consistent. To test how far the network would reach, I went exploring with my Galaxy S7. I was able to connect to the network inside my detached garage with all the doors closed and in the park behind my house. This was the furthest connection, likely because the Orbi satellite was placed on a dresser near the back window on the second floor. I was able to go about 4 houses down in the other directions before losing the connection (the network was discoverable for several more houses, just couldn’t connect past the 4th house). Tests on an older model iPad, which has no internet access other than through WiFi, got similar results. I subsequently tested placing the Orbi Satellite in my detached garage (located approximately 40 feet from my backdoor) with all the house and metal garage doors fully closed. The Orbi Satellite had no problem locating the signal and forming a solid connection, allowing us full access inside the enclosed garage. Downloading files showed blazing fast speeds. An approximately 58MB app update (the largest I’ve noted while connected to my Orbi network) took 2 seconds to download. 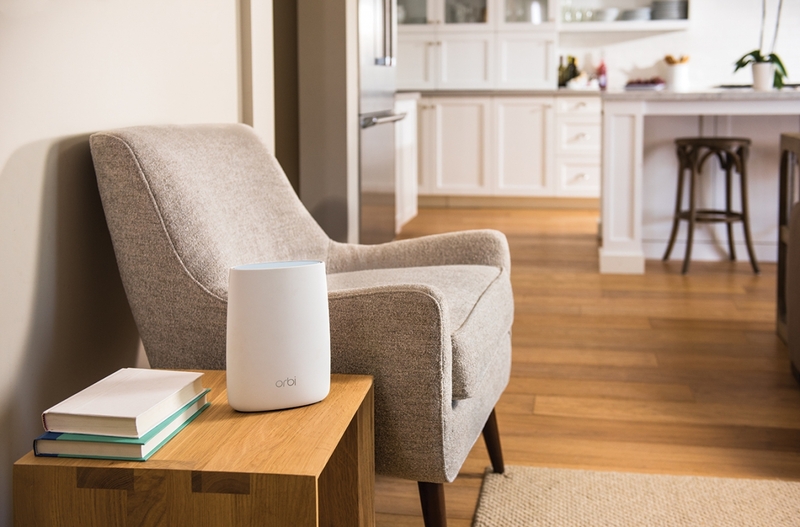 In conclusion, I have been thoroughly pleased with the functionality and connection strength of the Orbi system and highly recommend it for those with larger homes, those with many connected devices, and for those running multiple high-bandwidth applications across multiple devices. You can find more information on Orbi at NETGEAR's official site.